Michigan Honey has a delicate scent of honeysuckle and apple, crisp apple flavor, and just a touch of natural sweetness from local honey. Michigan Honey is our homage to the bees, which are imperative for pollinating the new blossoms on fruit trees in the spring. 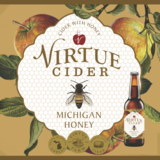 Our honey cider is a blend of hand-pressed heirloom Michigan apples that is aged in French oak barrels, and local wildflower honey.